I took a wrong turn..
Not a bad thing, as I love new sights. This time, walking through the neighborhood of Meadowbrook, within the Lake City area in the distant northeast region of Seattle. Here is Meadowbrook Lake, along Thornton Creek, in what used to be a sewer treatment plant from decades ago. Now it’s reverted somewhat to it’s natural state with the help of locals, over the years. You will see and hear a large variety of birds (many waterfowl) along the peaceful water body. You can stroll across the various walkways and come across some puzzling deco art, like in the above picture. 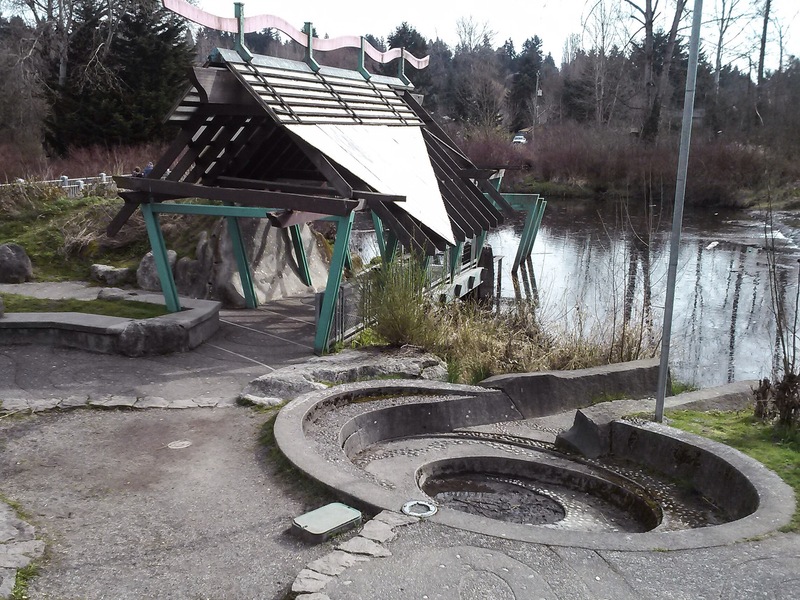 Posted on March 27, 2014 by Orion T.	This entry was posted in Art, Travel and tagged art, hidden places, lake city, meadowbrook, meadowbrook lake, Seattle, travel. Bookmark the permalink. ← The Cherry Trees at the University of Washington, Seattle..